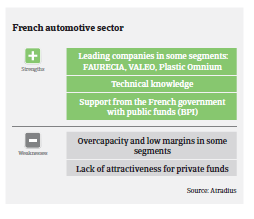 Next to the food processing sector, automotive is the second largest French manufacturing industry, with revenues of more than EUR 101.5 billion. Concentration is high, as automotive accounts for 11.7% of French manufacturing turnover, but only for 0.87% of manufacturing businesses. The two main French car makers alone, Groupe PSA and Groupe Renault account for about 80% of sector revenues. 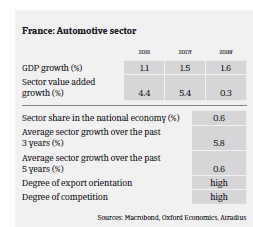 Domestically, the French automotive industry provides about 200,000 jobs, but the number has decreased over the last ten years due to automatization and production relocations abroad. According to the International Organization of Motor Vehicle Manufacturers OICA, French automotive production increased 5.6% in 2016, while domestic registrations or sales of new vehicles rose 5.7%. French carmakers, which have a 53% market share in France, recorded a 5.1% sales increase, benefitting from growing domestic and international demand. In H1 of 2017 the robust performance continued, with domestic automotive sales increasing 3%. The utility vehicles market performed well, partly driven by a rebound of the construction sector. French domestic car production is expected to increase 5% in 2017. Automotive parts and components manufacturers’ revenues are also expected to increase 2.5% in 2017 after growing 3.3% in 2016. In 2016 the margins of automotive suppliers benefitted from lower raw material prices. However, we expect this positive trend to end, as metals prices are expected to increase again due to lower global production capacities and current dynamic demand. Structurally the margins of suppliers remain under pressure as the powerful car manufacturers demand greater productivity, coupled with lower prices. A key factor to preserve profitable growth in the suppliers segment is the ability to stay close to the buyers, i.e. to follow large car producers overseas, as original equipment manufacturers (OEMs) tap into dynamic markets and/or outsource their production facilities to places with lower production costs (e.g. Eastern Europe, Turkey, Morocco). However, this and the shift towards more environmental-friendly engines require large investments in machines, R&D and raw materials, in a segment already highly dependent on bank financing (both short and long term debts). While banks were rather unwilling in the past to provide credit to the automotive suppliers subsector, the on-going rebound has further facilitated increased access to bank loans since 2016. The French suppliers segment is currently in far better shape than five years ago, and the short-term outlook is rather benign. 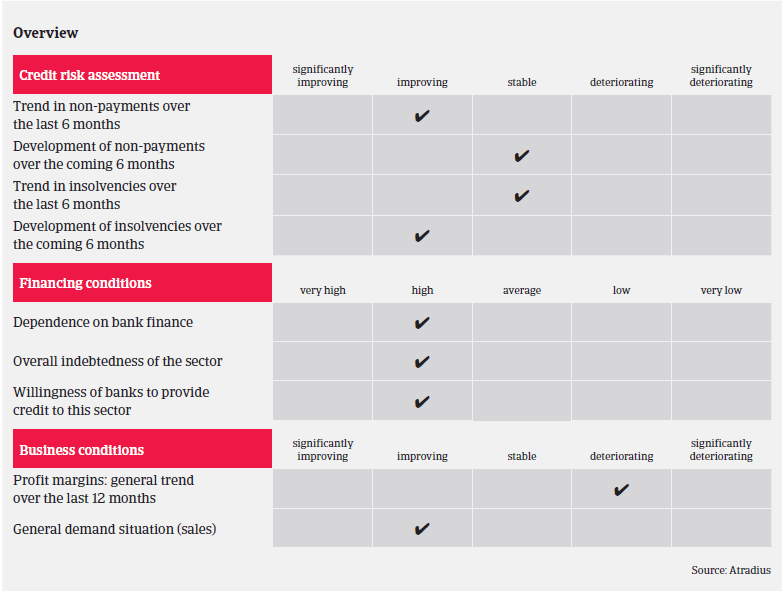 However, as some major structural issues persist (low equity, high working capital, investment requirements leading to high debt levels and financing needs, coupled with strong competition and price pressure), any demand downturn in the future could seriously affect suppliers, especially those who are highly geared and positioned at the lower side of the value chain. On average, payments in the French automotive industry take 60 days (end of month) and timely payment is important, there are few protracted delays. Payment delays have decreased in H1 of 2017, and we do not expect any fundamental change in the coming months. We expect insolvencies in the sector to decrease in 2017. The default rate is in line with the overall trend in French business insolvencies, where business failures are forecast to decline 5% this year. Given the solid performance in 2016 and the positive business outlook for 2017, our underwriting stance for the French automotive industry remains open. However, as in previous years, we continue to closely monitor some weaker players who rank second or third in the subcontracting chain, especially smaller suppliers engaged in foundry work, small stamping and/or producing items with low technology requirements. Businesses in those segments remain susceptible to higher risks, as the trend to outsource production overseas and high competition from foreign companies has led to overcapacity. We also closely observe the development of business margins in the suppliers segment, putting emphasis on the identification of vulnerable companies.